I usually go straight to the menus if there are any. I love seeing the way an author has assembled the various courses for particular occasions. Otherwise, I start with the entrées. 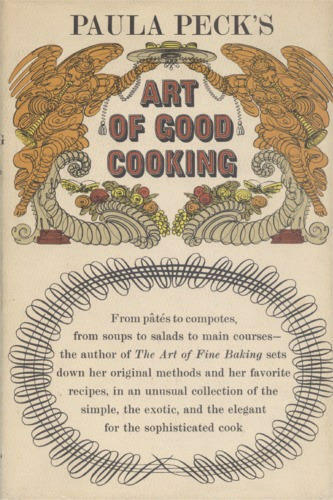 As an inveterate cookbook collector, I know I am not alone in having particularly idiosyncratic behavior in how I approach reading such titles. That certainly does not mean I have cooked from all my many volumes but I have most definitely enjoyed countless vicarious meals! While I am not hosting any events this holiday week, I have been inspired to think about how summer invites entertaining with ease and what I might make for such an occasion. 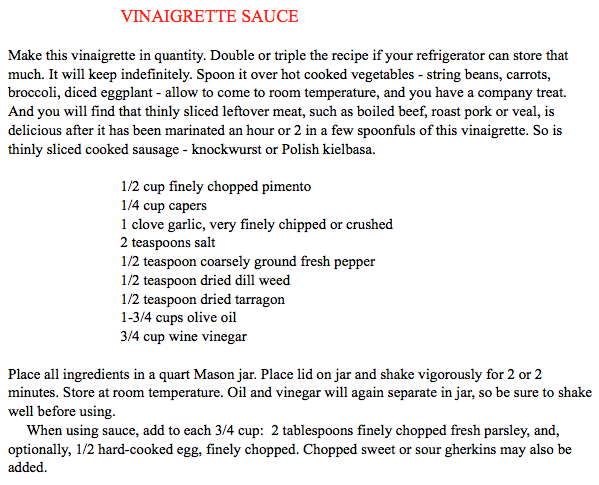 I’m sure many of you have your own trusted vinaigrette recipes, but if you don’t or would like to experiment with something new, I can heartily recommend this version! I am particularly fond of making and storing it in classic glass containers with the rubber rings, like le Parfait jars. 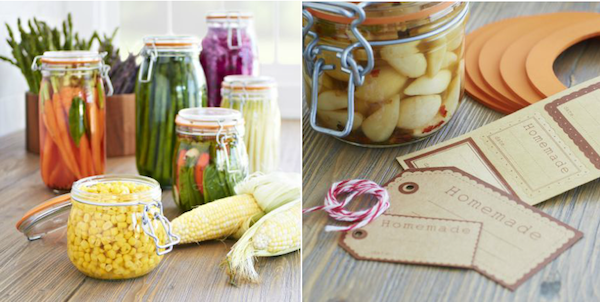 The jars also make lovely containers for homemade comestible gifts, especially when presented with a charming label. And speaking of gift giving, nothing is ever as appreciated as a homemade present. It represents effort, thoughtfulness and creativity. So be sure to make extra of the vinaigrette so that special hostess on your list can be the recipient of your culinary skills! And be sure to include a charming card with the recipe so she doesn’t have to call you later!! Felix Doolittle and Easton Place have some enchanting ones. This entry posted in books, entertainment, food and drink, gifts. Entry Tags: Felix Doolittle Stationery, Kilner jars from Williams-Sonoma, Paula Peck, Rice Salad, Summer Recipes, The Art of Good Cooking, Vinaigrette Dressing Bookmark the permalink. ← Cheers to the Red, White & Blue – Happy 4th of July! What great recipes – I am excited to try both – Perfect for this hot weekend! The vinaigrette sounds like a winner. Thank you. And thank you for the recipe card sources. A delightfully old fashioned, but useful bit of paper stock in this age of electronics in the kitch. This sounds yummy. 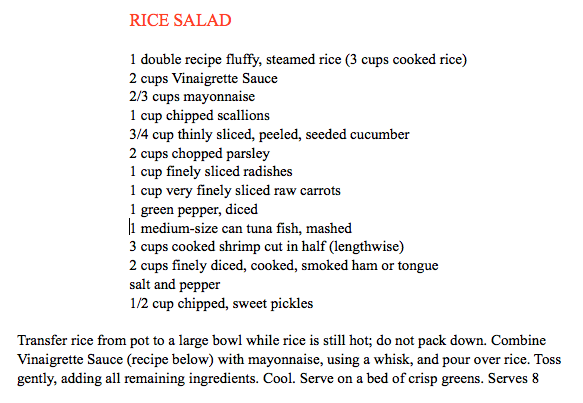 I bet you could make it a little ahead of time and the rice would have time to soak up the vinaigrette. I used to collect cook books, also–it’s a great way to go traveling internationally without leaving home. Hope that you are having a great summer. Have same book…. from my Mum’s cookbook collection! She used to make the sauce in the summer! Must try this for myself! Thanks, Q! yum! Is it lunchtime yet?! (and…we both apparently love alliteration;) ) Happy weekend! Oh, yum! These recipes look amazing! You had me at dill, tarragon & capers :) And I love your ideas for beautifully stored foods and hostess gifts. Perfect. Thank you for including the personalized recipe cards from Easton Place. Love this post. And the homemade gift is always the best for sure. I try to make sure I do those at least once a year. It means so much. Oh thank you! I do not have a vinaigrette sauce recipe. I love anything with capers! I don’t think I’ve ever written this to you, but when I pop on your blog it makes me happy. I just adore your side tile and the orange in your title! What a cozy post! Your vintage cookbook is so charming and I love the sound of that rice salad. Lots of good ideas here for summer entertaining. Have a lovely weekend! Thanks so much for the post. Paula Peck was my grandmother. I have a blog where I revisit recipes from both of her cookbooks as well as some unpublished ones. Please feel free to check it out. Thanks again. It’s always great to see her recipes in use! The recipe and photos look great, but you mention the wrong jars! You photo shows the French jar, Le Parfait, which are indeed THE PERFECT jar for this recipe!! They can be found at West Elm Market or Crate and Barrel, as well as a lot of other kitschy shops. Enjoy!!! Thanks William! At the time when I wrote this, Williams Sonoma carried a version called the Kilner jars. Since they no longer exist, the link doesn’t work. I have now linked to le Parfait’s site where you can find a variety of sizes as well as preserving recipes and more! 80 queries in 0.508 seconds.